Robert H. Barlow sent this photograph from his collection and he would like some information about it. He thinks the location might Hest Bank. But maybe you know better. Which station? Which engine? What carriages? The station is Hest Bank, looking north.� The engine is a George and the white patches in the distance might be Hest Bank water troughs . I am a railway enthusiast from Hong Kong. I think I can help in identifying this photo. As I can see, the loco is a 4-4-0 with belpair firebox of some sort. One coach seems to have a clerestory roof. Others appears to be bogie coaches. This photo may have dated from the turn of the century. The photograph is Hest bank and yes the water troughs are in the distance the bridge stood until Easter 1973 when it was replaced with a taller structure to accommodate overhead electrification. I am unable to date the photograph. The photo was taken in 1910 or later because the engine is a ‘George the Fifth’/‘Queen Mary’ which appeared in that year. It seems to be in original condition (e.g. no sandbox on the front end of the splasher) so I’d guess an early date, probably pre-WW1. 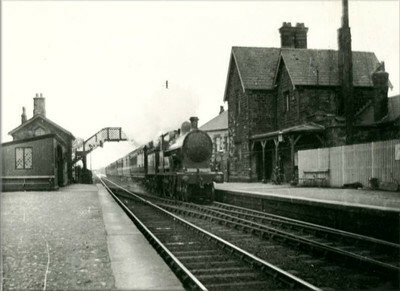 The location of the picture is definitely Hest Bank station some�years ago. I live in the small house on the left hand side of the picture. I have lived there for several years and have done a lot of research into the history of the�Hest Bank station�and not in all of this time have I seen the picture found here. Also in the picture is Victoria Tea rooms which remains on the edge of the now crossing and is currently for sale. The bridge was designed by Eric Lancaster and he was involved in the erection of it in 1973. It would be very interesting to find when the picture was from because of the pictures I've seen the small house hasn't had an extension on.